Although I am a huge fan of both Moonrise Kingdom and Fantastic Mr Fox, I have recently become tired of the typical ‘Wes Anderson Aesthetic’. With McDonalds TV adverts and brand Instagrams alike utilising the look to come across as more marketable, trustworthy and twee, I have become more cynical about the inherent high quality of the style. 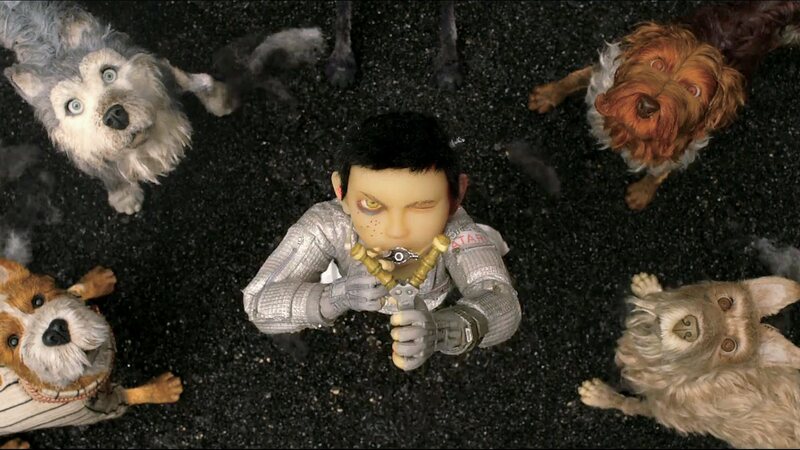 However, Isle of Dogs, as well as containing a charming and relevant story, serves as the best example of how Anderson’s aesthetic can be used to it’s fullest potential. Stop-motion animation, as well as being executed extremely effectively by Anderson on the two occasions he has now used it, lends itself incredibly well to the attention to detail put into each of his films. I have found that this is the separator between his own films and the imitators that have followed it; symmetry and pastel colours do not make a Wes Anderson film. From the outset, every single frame of the film is packed with enough detail that it’s a genuine treat to try and spot little visual jokes or hints at plot developments before the film moves on. This isn’t to say that the camera lingers on only a few locations though, as this care is brought to many locations that only appear once or twice, giving the whole film an enormous sense of scope and scale on both the titular island and in the city of Megasaki where the rest of the movie takes place. Anderson’s choice to have the cast for the primary group of characters in the film (the alpha dogs on Trash Island) record their lines in a group together works wonderfully, with the dialogue feeling almost unusually natural and conversational for an animated film. Bryan Cranston carries a huge amount of the film fantastically well with his gruff voice performance of stray dog Chief, and Koyu Rankin serves as a gentle yet funny foil with the young boy Atari, the bond between the two serving as the heart of the film. The anti-propaganda message in the narrative is well delivered if a little simplistic, and helped by the surprisingly dark tone of the film: the risk of character deaths never feel too far away, and references to cannibalism and suicide consistently remind you of the danger. Various critics have commented that despite Anderson’s clear love for the Japanese culture he depicts in the film, he has (to an extent) appropriated a culture that is not his to flaunt, and used the surface aesthetic of Japan without respecting other aspects of the culture. Although he hired Japanese actors like Rankin and Yoko Ono to depict the Japanese characters of the film, and his playing with translation is fun and interesting, the main cast of dogs are almost entirely white and American, with the lack of subtitles potentially distancing the Japanese characters from a depiction of what is their own culture. Casual references to Hokusai and Sumo wrestling feel somewhat touristy rather than a true exploration of a living, breathing country. However, much of this criticism has come from white Western critics, with Japanese audiences largely enjoying and appreciating the film rather than taking it as an affront. Ultimately, whilst I agree with much of the previously stated criticism and definitely advocate for these aspects of the film being pointed out, I don’t feel as though white Western viewers should attack the film on behalf of an audience sector that is not particularly offended. Overall, I hugely enjoyed the meticulous detail of the film and, despite the case for it being a little simplistic in depicting Japanese culture, would highly recommend Anderon’s latest outing to both longtime fans and people like me who needed their faith reignited in the director and his now ubiquitous aesthetic.